To date, all the more common diseases of the liver and biliary tract that is adversely affected by drugs, viruses, alcohol, fatty foods and unhealthy lifestyle. The result of these effects are hepatitis, cirrhosis and gallstone disease. In the treatment of these diseases is well established the drug "Ursosan" containing ursodeoxycholic acid. Description of the drug "Ursosan"
This medication and its main ingredient is ursodeoxycholic acid (UDCA) is effective in the treatment of diseases of the liver and biliary tract, affecting a huge number of different pathogenetic mechanisms. The effect of ursodeoxycholic acid is non-toxic, since it is synthesized in the liver and represents one of the natural components of bile. The use of "Ursosan" allows to dissolve cholesterol gallstones and prevent the formation of new stones. Treatment "Ursosan" contributes to the successful elimination of diseases of the liver, accompanied by the syndrome of cholestasis. The price of the drug is not cheap, however its effect in the treatment of relevant diseases proven and can not be questioned. Thus, the "Ursosan" stabilizes the membranes of liver cells, making them more sustainable, increases the passage of bile, removes toxic acids through the intestines and reduces the immunopathological reactions. In addition, the drug reduces the level of cholesterol in the bile and also reduces the destruction of liver cells and the synthesis of connective tissue in it. The indication for the use of "Ursosan"
The preparation is actively applied in Hepatology in such a chronic active hepatitis syndrome, cholestasis, toxic liver damage of alcoholic or other origin, primary biliary cirrhosis, primary sclerosing cholangitis and biliary dyskinesia. Also "Ursosan" gepatopatia prescribed for pregnant women, cystic fibrosis and cholestatic newborns. Regular use of the drug when conservative treatment gallstones helps to improve the rheological properties of bile and dissolving the formed stones. Gallstone disease is caused by a lack of dietary fiber in the diet, impaired lipid metabolism, atherosclerosis, diabetes, obesity, hypothyroidism, hormonal contraceptives, Smoking, alcoholism and sedentary lifestyle. "Ursosan" can dissolve only cholesterol stones which constitute 80 to 90 percent of all gallstones. Surgical removal of large stones from the gallbladder and biliary tract is more likely to struggle with the consequences than with causes. After surgery, the patient acquires a postcholecystectomical syndrome and the high probability of the formation of new stones in the bile ducts. Abstract to the drug "Ursosan"
"Ursosan" orally. Capsule drug should not be crushed or razdevayutsya. The medicine should preferably be taken before bedtime, during the term, opredelennogo your doctor. When cholesterol gallstones "Ursosan" is assigned at the rate of 10 milligrams per 1 kilogram of body weight per day. At the beginning of treatment is recommended to control the activity of liver enzymes and sizing of the stones. This should be ultrasound or cholecystography at least every six months. Side effect by taking "Ursosan" can be a hives, diarrhea, pain in liver, vomiting, calcining gallstones, as well as tranzithornoe increase in liver enzymes and partial decompensation of cirrhosis after the end of therapy. 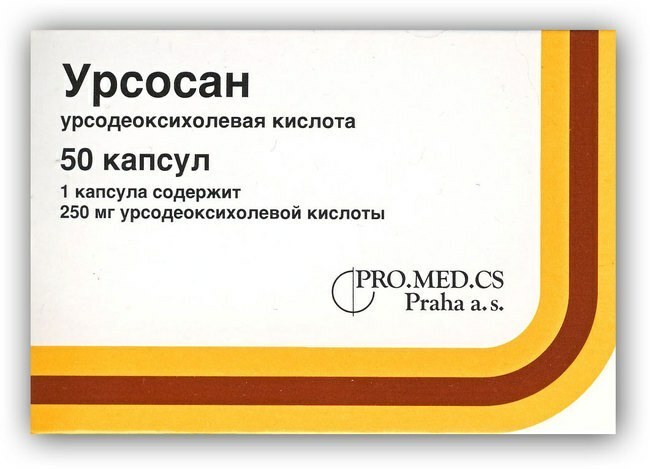 The manufacturer of the drug warns that "Ursosan" is contraindicated in case of hypersensitivity to ursodeoxycholic acid and additional components capsules, acute inflammation of the gallbladder and his ways, kidney and liver failure, as well as during pregnancy and obstruction of the bile ducts. Among the contra-indications included calcified stones and sometimes the age of children less than five years. Caution use in patients with peptic ulcer disease, inflammatory bowel diseases and extrapersonal cholestasis. It is strictly forbidden to take "Ursosan" patients with biliary colic and gallbladder not visualized ultrasound and radiological methods.